We ended our driving tour with a few expensive days in Crested Butte Colorado spoiling our children and completely blowing the budget. Accommodations for March were a respectable $2000 thanks to friends and family who hosted us for 10 days. Daily spending was, ummm over budget. At least we can justify spending our kid’s inheritance on our kids, besides Cap really needed new ski boots and Jake needed new skis, and a jacket, and ….. well you get the picture. From Crested Butte we dropped Cap at Salt Lake where she caught a flight east to visit her boyfriend in Philadelphia. Kelly and I pushed on to Spokane where we spent a week with Kelly’s parents and dropped off our car. A week of family, friends, celebrations and Gonzaga basketball. Then it was off on a Condor air flight to Frankfurt Germany. In Frankfurt we picked up our brand new leased Citron Aircross. Leasing proves to be quite a bit cheaper than renting when you need a car for two months. The process so far has been very positive and we highly recommend Ideamerge if you are in need of leasing in Europe. 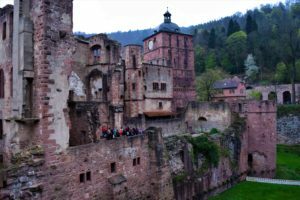 After picking up the car we headed an hour south to Heidelberg for our first stop. In Heidelberg we had a great Airbnb apartment about a mile outside of the old town. 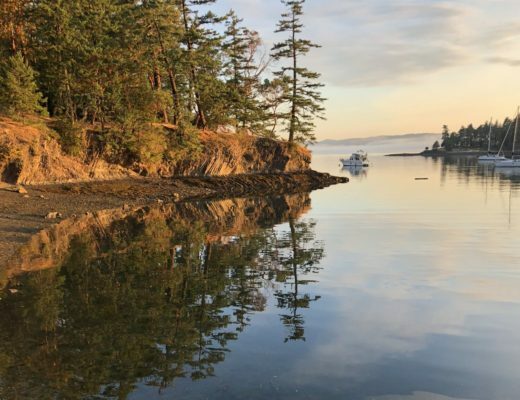 As with all of our Airbnb homes you can find a link to them on our calendar, just click on any date. 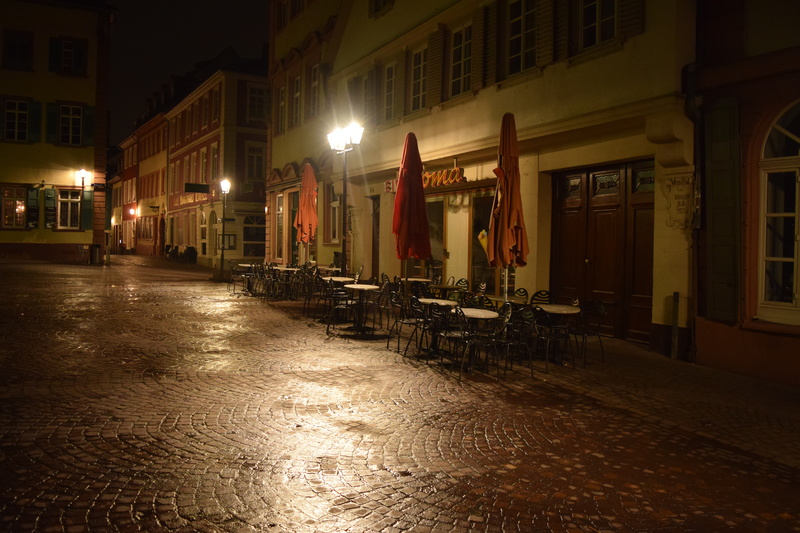 We thought Heidelberg would work well for a low key stay where we could adjust to the timezone. It worked out great. 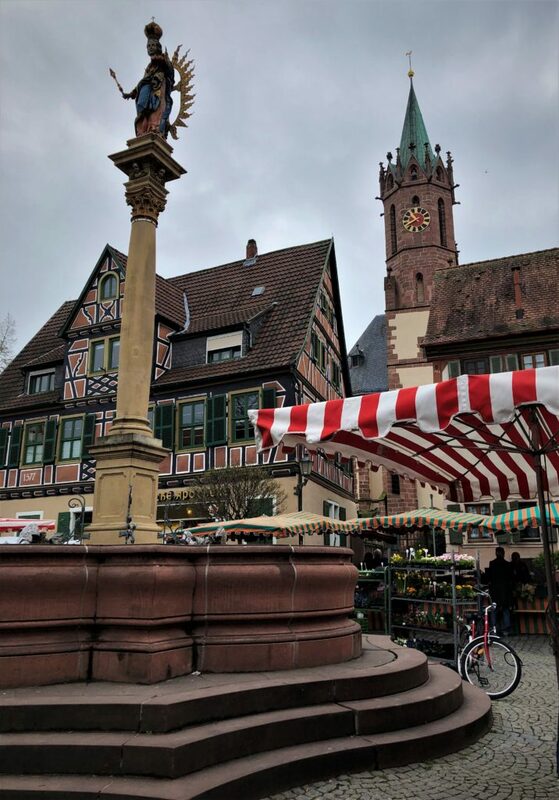 A classic German city with a long history dating back to the fifth century. 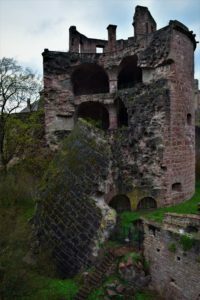 Heidelberg Castle is a mix of buildings and ruins built in various styles from the 1300’s through the 1700’s. It was destroyed by the French twice and its final destruction came by way of a lightning strike in 1764. 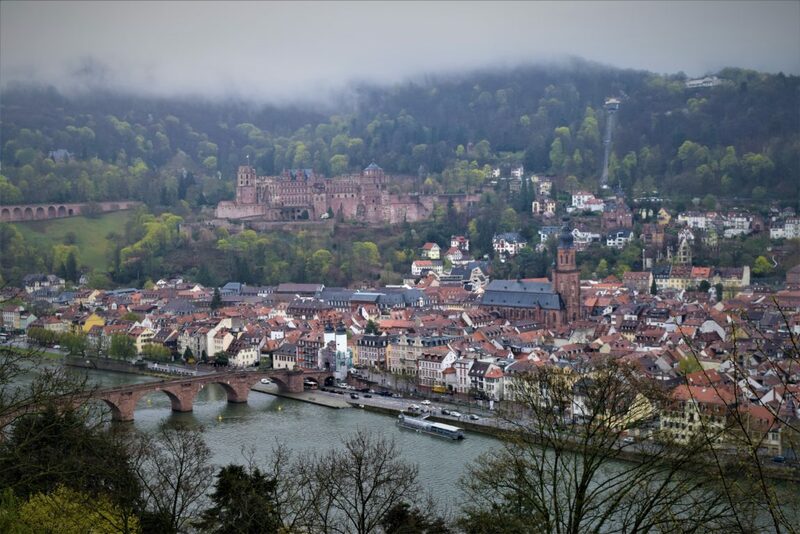 On our first full day in town we took the Funicular up to and beyond Heidelberg Castle. 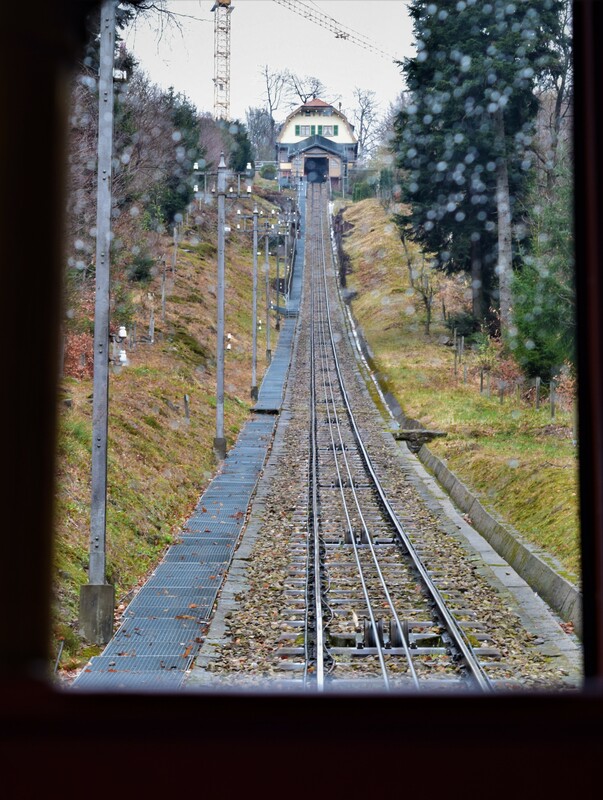 I had heard of a Funicular before but really had no idea how they varied from a cable car. 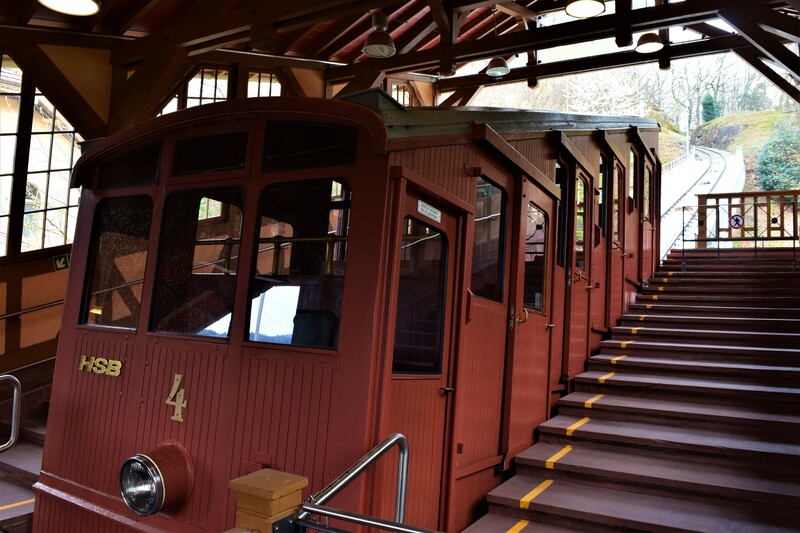 If you are equally uninformed I can explain that a Funicular has two cars, one at the top of the hill and one at the bottom, they are connected by a long cable which is wrapped around a pulley at the top. As one car rolls down the hill it pulls the other car up. The cars themselves counterbalance each other so only enough power is needed to move the weight of the cargo in the car. In fact, many early systems used water ballast so the only energy needed was for a pump at the top which would fill the ballast tank on the upper car until the weight exceeded that of the lower car and gravity would start the car rolling downhill pulling the other up. 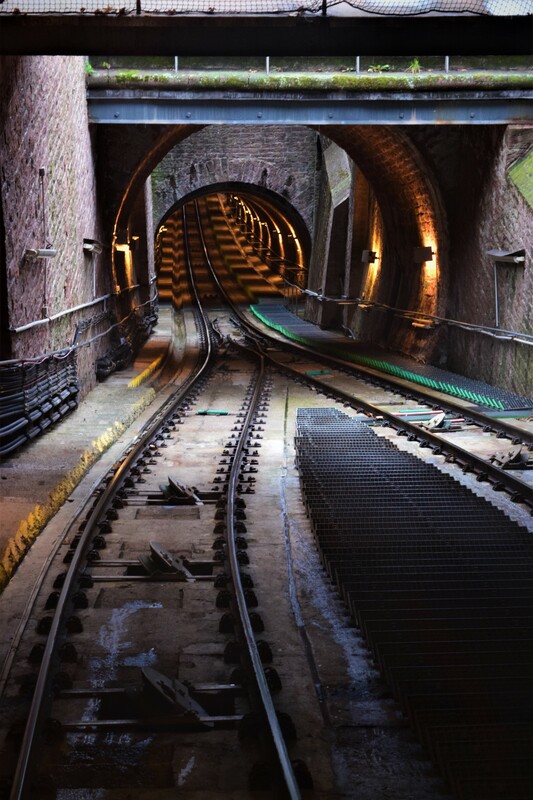 That is your Funicular lesson for the day. We wandered around the castle and grounds between showers and stopped into the Apothecary museum a must stop for my medical wife, mildly interesting for the rest of us. Of more interest to me was the Great Tun, an enormous wine barrel which holds 58,000 gallons of wine and is large enough to have a dance floor installed on top, because you need to dance if you have 58,000 gallons of wine. The cost for the castle admission and Funicular was $9 per person. (actually 8 euros but I rounded it to $9 US with the 1.12 exchange rate) We are already noticing that Europe is easier on the budget than the US. Note the $9 entry fee compared to our tours in Phoenix which ran around $35-$40 per person. Food here is a little cheaper but you really see a difference with beverage costs. A good beer or glass of wine will run $5 or less. In the US we could only find a $5 beer on a happy hour special and it was common to be charged $10-$15 for a glass of red wine. Additionally, you are not expected to add 15%-20% to every bill in Europe. Can you guess which lunch is mine? 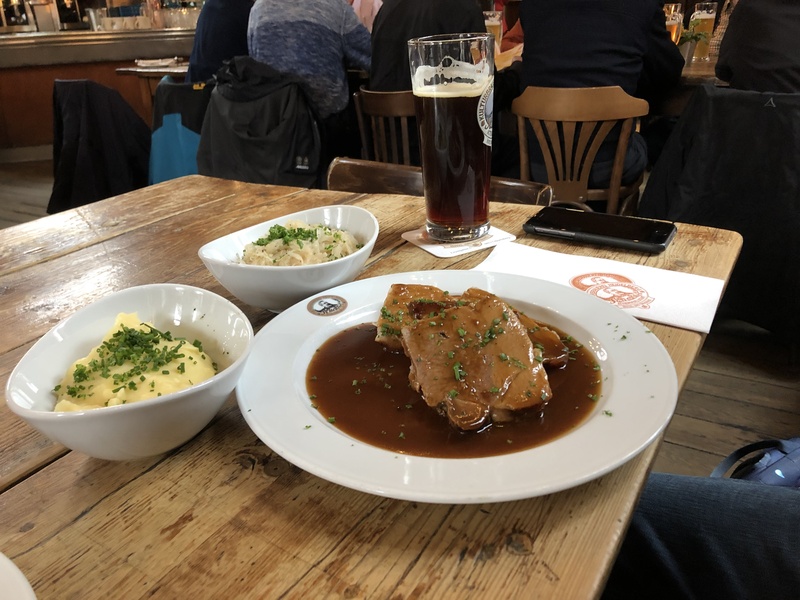 After a rainy tour of the castle we went in search of a good lunch and found it at Kulturbrauerei, the German equivalent of a micro brewery, recommended to us by Martin our Airbnb host. Fantastic meal, great staff and most important, excellent beer. So good in fact that we stopped in for another the next day. Day two we circled the city taking the Philosopher’s walk through the hills on the opposite side of the river from the old town and castle. A cold and cloudy day made for rather muted and subdued views. A beautiful walk regardless but we were constantly wondering how amazing it would be in late spring and summer when the trees and vines had leaves, or in Fall with the changing colors of Autumn, or maybe even with a sunny sky. After the Philosopher’s way we found ourselves at the far east end of town and thirsty enough for a stop at Kulturbrauerei. After a quick pint we headed back through town toward our apartment on the west end. But the weather did not cooperate, or maybe it did cooperate as the wind and rain convinced us to find shelter in the cozy confines of the White Swan Pub, a $5 Dunkle for me and a $5 Baileys for Kelly made us forget the bad weather for a moment. Once the rains subsided and Kelly regained circulation in her fingers we ventured out in search of Schwarzer Peter, another restaurant suggested by our host, Martin. Another great pick. We arrived to a half full restaurant and by the time we left after 9 PM they were turning customers away. Oh, and the beer was very good too. With Friday being our last day in Heidleberg I was lamenting not having seen the city and castle in lights at night. So, unable to sleep I decided to head out for a 4 mile walk at 4 AM. Kelly was smart enough to stay in bed and checkout my pictures at a more reasonable hour of the day. It was a cool morning in the upper thirties but no wind or rain. 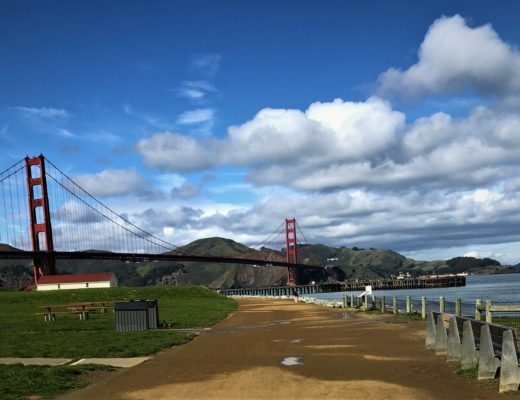 Imagine my surprise as I crossed the new bridge about a mile into my walk only to look up and see nothing but blackness. Apparently they don’t light the castle at 4 AM, nor do they light the various church steeples at that hour. So I too will have to rely on someone else’s photos of the castle in lights. Well it was a nice walk. 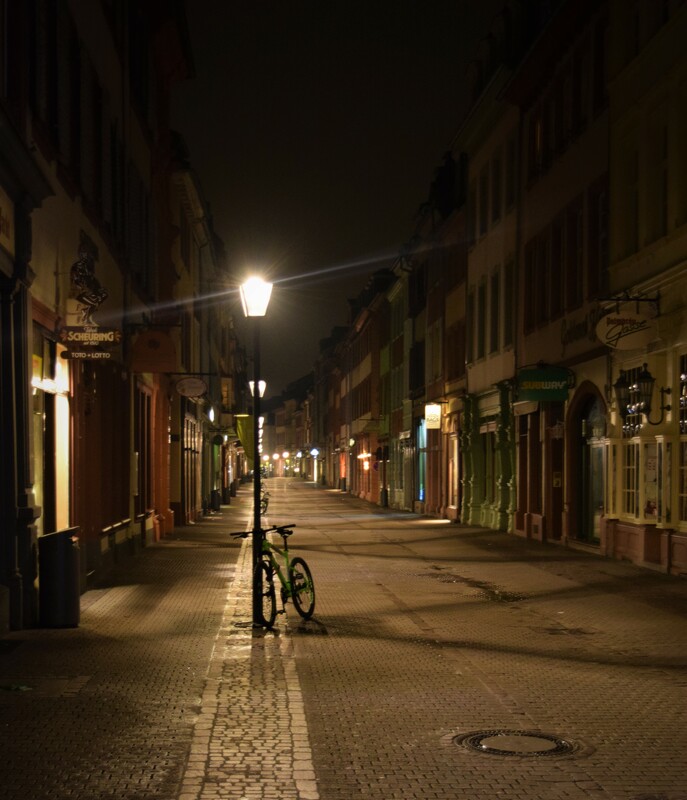 No crowds at 5 AM. Leaving Heidelberg after three nights we decided to make a stop in the town of Ladenburg, another Martin suggestion. Another great find. A beautiful medieval walled city dating back to Roman times. We wandered around the town, stopped in for a coffee and pastry and picked up some cheese from the farmers market. 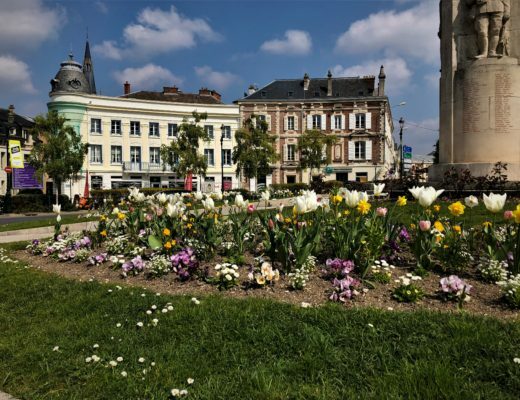 The town itself is known as the home of Karl Benz inventor of the automobile. A more sobering find as we walked the town were brass plaques showing the homes and names of former Jewish residents who were rounded up and sent to concentration camps in October 1940. 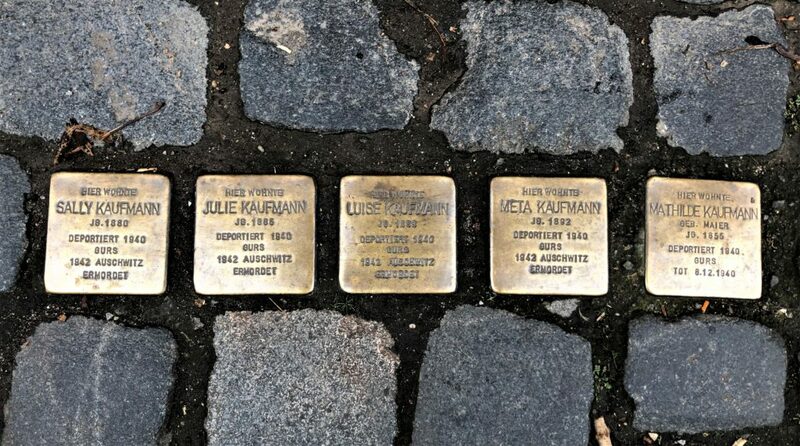 We refuse to forget the Kaufmann family or the fear and hate that lead to there deaths. 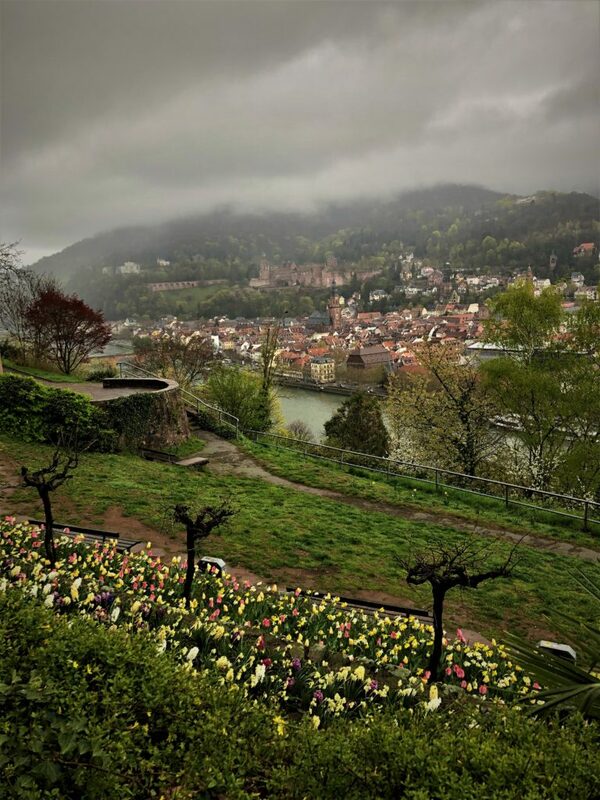 Next Post Germany's Rhine River Valley and Boppard. Hi. I’m friends with Michelle Corsi who forwarded your blog post. If you are coming to Italy, send me an email. We arrive 24 April, and live ther 6 mos a year. In the meantime, I’m looking forward to reading about your adventures. Hi Carol, thanks for following. Where in Italy? We will be in the south of France in May, northern Italy is an easy drive. Otherwise we may be in Italy in 2020. Sherry and I were at Laufen, also a walled city. It is in Bavaria near Austria. We loved its charm and I brought home a modest souvenir, a shot glass, which is on my bar cart. I love reading about your experiences, both good and bad. Your meals both looked good. 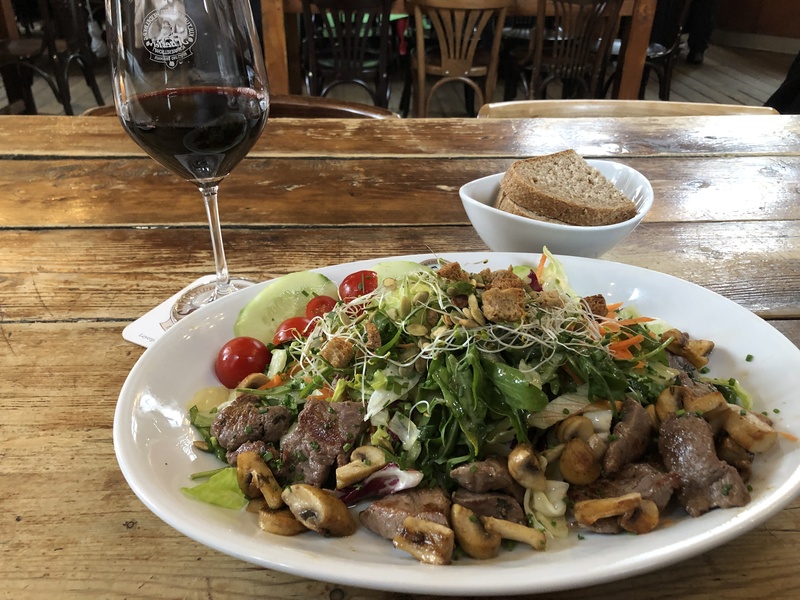 The meat on the salad looked tasty! 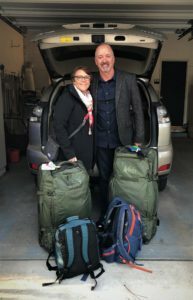 Please enjoy your time together and all of your travels! Thanks Jim, we were in Bavaria with the kids several years ago, hope to get back soon, if we do we will have to check out Laufen. The surprises and unexpected game changers are what make a trip/ 6 month European living so special. Keep enjoying all those treasures. See you real soon. You’ve done well with all your worldly possessions……Must have been difficult to leave any extra space for future purchases.